Gentle enough to be used from head to toe. Essential oils of Tea Tree and Lavender lend a skin pleasing lather while french clay pulls impurities. Made with high levels of essential oils, not fragrance oils, these aromatherapy bath bars cleanse your skin with a rich, yet gentle lather, making them ideal for even the most sensitive skin. Results: Clean, Sweet Smelling, Softer Skin. 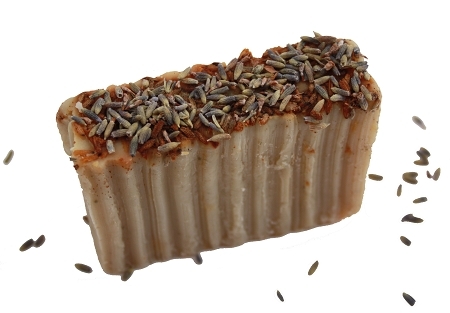 Made the old fashioned way, they are 100% pure soap, therefore will not irritate your skin and will last twice as long as commercial bath bars. Our bars of soap take six and a half to eight weeks to cure. They are detergents and sulfates FREE. They are high in glycerine, gentle, non-toxic and all natural. You will love the difference. They DO NOT contain artificial preservatives, rendered animal fat, detergents, petroleum products or cheap hydrogenated oils.